The land locked country of Bolivia, South America, has so much offer the traveller who wants to experience adventure, natural beauty and fascinating culture. 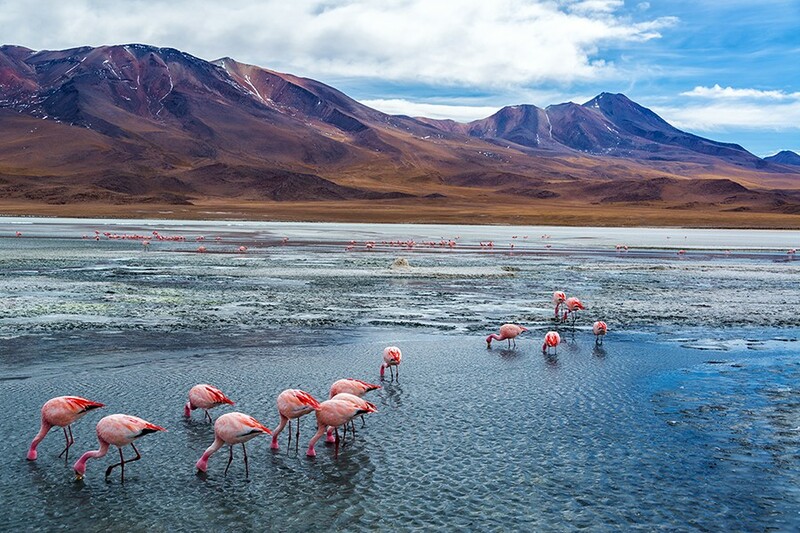 From the world’s highest navigable lake, to the infamous ‘death road’ and the photogenic salt flats, this Bolivia itinerary shows the best of this must-see destination for anyone travelling to South America. The great beauty of Bolivia is the stunning diversity in the natural environment. About a third of the country lies in the region of the Andes Mountains, where the wondrous altiplano extends as far as the eye can see, whilst the largest city rests in the tropical lowlands of the Amazon Basin. Bolivia’s history provides travellers with a multicultural society and the remnants of ancient religions, Spanish architecture and a multitude of living languages. Travelling Bolivia presents the avid traveller with experiences as diverse as the country and taking the time to explore these different areas of the country will provide you with the ultimate Bolivian experience. 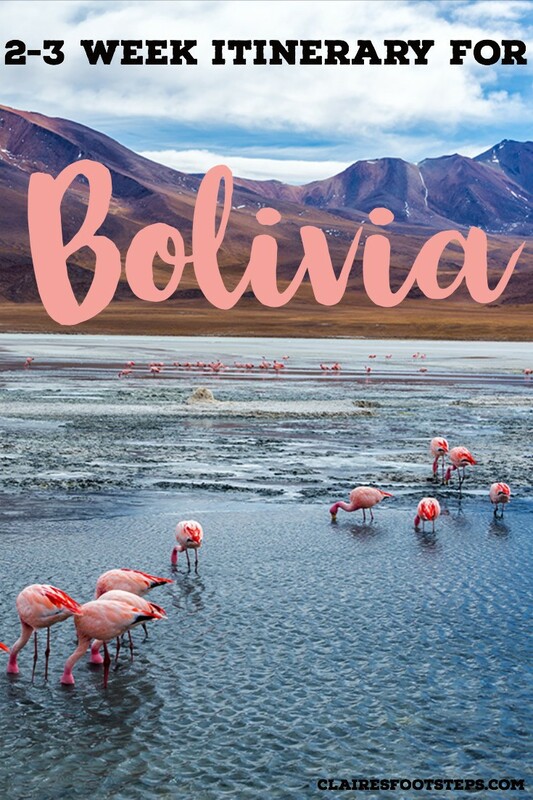 This 3 weeks in Bolivia travel itinerary will take you from the Peruvian border, around the western part of the country, through its capital cities, to its amazing nature from Amazonia to high altitude mountains, and to the salt flats at the Bolivian border with Chile. If you’re looking for a Peru and Bolivia itinerary, you can use this post with this Peru itinerary for a comprehensive adventure! Straddling Peru and Bolivia, Lake Titicaca is the world’s highest navigable lake, sitting an elevation of 3,812 metres above sea level. But the lake is so much more than that. 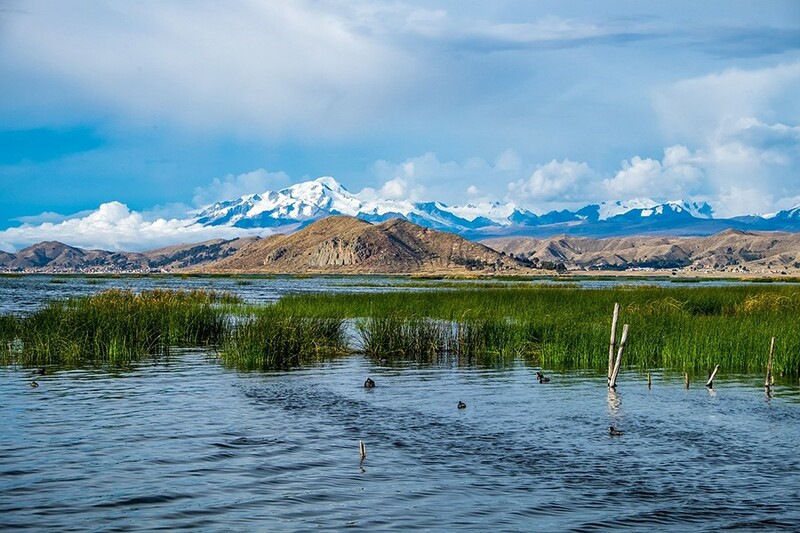 Lake Titicaca is spoken of as the birthplace of the sun and the Inca, and its deep, reflective waters will capture your heart. After the border crossing into Bolivia from Peru, the road takes you into the small town of Copacabana. If you do not have your own vehicle, there is public transport from the border post to Copacabana – it is approximately a three-hour journey. Copacabana is the place to base yourself for a few days whilst you explore the history of the lake and its people. With brightly lit days and bitingly cold nights, Copacabana is a well-visited tourist town with plenty of local cafes and restaurants. There are ample tourist tat shops and plenty of opportunity to indulge in a cold Bolivian lager or two! Getting out onto the lake is a must and two of the most popular islands are Isla del Sol and Isla de la Luna. Isla del Sol is known for its Inca ruins and the Roca Sagrada is rumoured to be the birthplace of this ancient culture. Hiking trails are available on both islands to get you to these sites and it is possible to overnight on Isla del Sol. Foreigners can be asked to pay a ‘tax’ to hike the trails, so make sure you understand what fees are applicable before you travel to the islands – generally these fees must be paid in cash. Given the cultural significance of these islands, be prepared to be surrounded by other travellers and understand that the experience will be ‘touristy’. Despite this, visiting places of such cultural and religious significance can still be a moving experience. Whilst in Copacabana, a visit to the main square at Plaza 2 de Febrero and the nearby Catedral de la Virgen de la Candelaria should be on everyone’s list. Famous as a site of pilgrimage and festival of the Virgen de la Candelaria in February, visitors can enter the Catedral any time of the year for a glimpse of the statue of the Virgen. Hotel: Although it is called Hostal Las Olas, this is not backpacker accommodation – it is perfect for people wanting a beautiful stay over Titicaca. Laze back in a hammock and watch the world go by or walk to the nearby attractions of Copacabana. Each room has an en-suite bathroom and a desk. Click here for rates and to book. There are regular bus connections between Copacabana and La Paz that take approximately three to four hours. These can booked through your hostel or hotel. For those with their own transport, take note of this tip: There is a police check point on the way out of Copacabana that is notorious for demanding ‘fees and taxes’ (read bribes) from tourists. This checkpoint is clearly marked on the app iOverlander and can easily be avoided by taking several dirt roads out of town, joining up with the main highway a couple of kilometers down the road from the checkpoint. Never ever pay any type of bribe. The reason you are being asked to pay one at this checkpoint is thanks to the travellers before you who paid it. 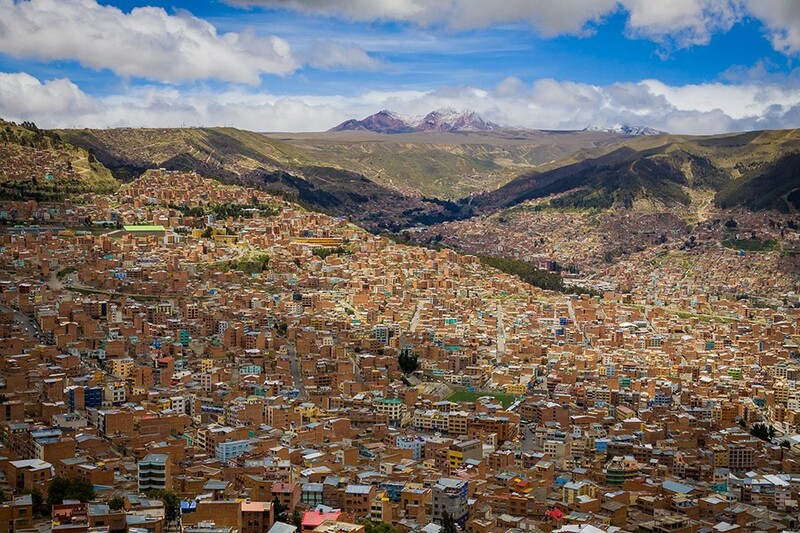 Founded in 1548 by a Spanish Conquistador, La Paz is a large city set into a steep sided valley, surrounded by the impressive snow tipped mountains of the altiplano. There are plenty of well-priced hostels, good food and drinking establishments to be found. Just like many other cities, a self-guided walking tour of the sights that interest you is a great way to explore the city. If you prefer, there are also plenty of guided walking tours that are well priced. Don’t feel like walking? Mi Teleferico is a cable car public transport system that will help you get where you want to go. On the plus side, this is a great way to see the city from a distance and experience the vistas of the valley. A visit to La Paz is not complete without a wander through the Mercado de Brujas, which translates as Witches Market. In this weird and wonderful market, you will find goodies that all good witches need. If you are searching for rare or special remedies, ingredients and aphrodisiacs, then this is the place you will find it. Want to take some photos of all this wonderful weirdness? Make sure you ask first! This is, after all, the Mercado de Brujas and no one wants to be cursed! La Paz also has plenty of museums, incredible old churches and festivals almost every month. Be sure to check out what’s on before your visit or ask at your hotel. Hostel: Wild Rovers Backpackers is known as the best hostel in La Paz. It has a great social scene, chill out areas and an on-site bar. It’s a great place to kick back and meet some other travellers after a long bus ride! Check out prices and book by clicking here. Hotel: Hotel Nuevo Sol is higly rated, with spacious, airy rooms and private bathrooms. Room rates include free wifi and breakfast. Check it out and book today by clicking here. 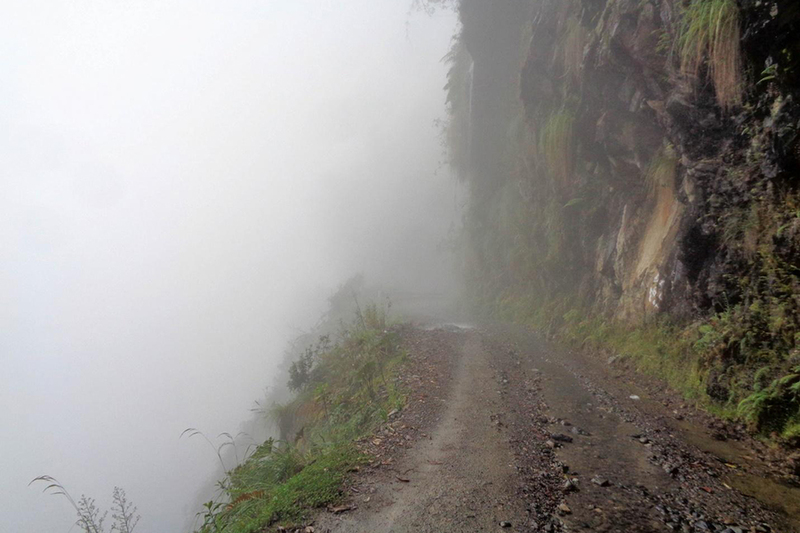 A trip to Bolivia isn’t complete without a trip down the infamous Bolivian Death Road – locally known as Yungas Road. This stunning narrow dirt track sadly claimed many lives before the new road was built. 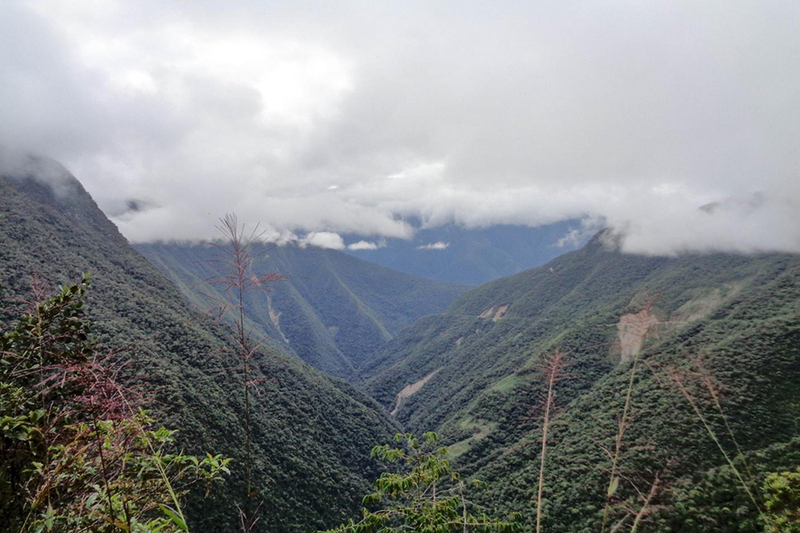 Expect to see steep drop-offs without guardrails, waterfalls tumbling onto and across the road and views across thickly jungled mountains that will take your breath away, if the altitude hasn’t already! Leaving La Paz and heading towards Death Road, the road steadily climbs towards La Cumbre (translating to the summit) pass, at an altitude of 4,650 metres. From here, it is downhill all the way to the town of Coroico, which sits at only 1200 metres above sea level. The scenery changes drastically from the cool altiplano to tropical jungle. During the wet season, November to March, visibility can be reduced due to fog and cloud, requiring extra caution and a view of just grey swirling clouds. During the summer months, the road is dry and dusty, and may be prone to rockfalls. In 2006, it was reported that driving this road resulted in the death of between 200 and 300 people each year. Once you hit the road, it is easy to see why. Now, the road is just a tourist road (a new, wider and safer road has been constructed), but prior to the opening of the new road between La Paz and Coroico, this single lane track was the main thoroughfare of all goods, public transport and commuters. It is frightening to sit on the edge of the road and ponder just how two trucks, or buses full of school children, navigated past each other. 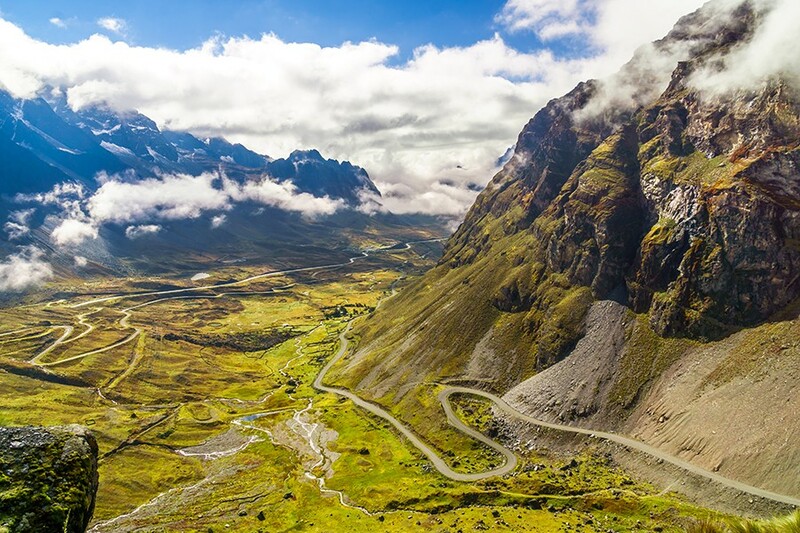 All travellers attempting Death Road MUST be aware that although Bolivian traffic laws direct drivers to drive on the right-hand side of the road, Death Road is an exception. The uphill travellers have right of way and driving on the left-hand side of the road allows them to hug the inside of the road. This means the downhill driver is travelling on the outer edge which, in theory, allows them greater visibility of the road and their vehicle’s position. the many blind corners. In other words, stick to the left-hand side. All travellers should take cash with them as there are tolls that must be paid to the communities along Death Road. Tolls are approximately 25 bolivianos per person and you may experience two, or three, toll points along the route. 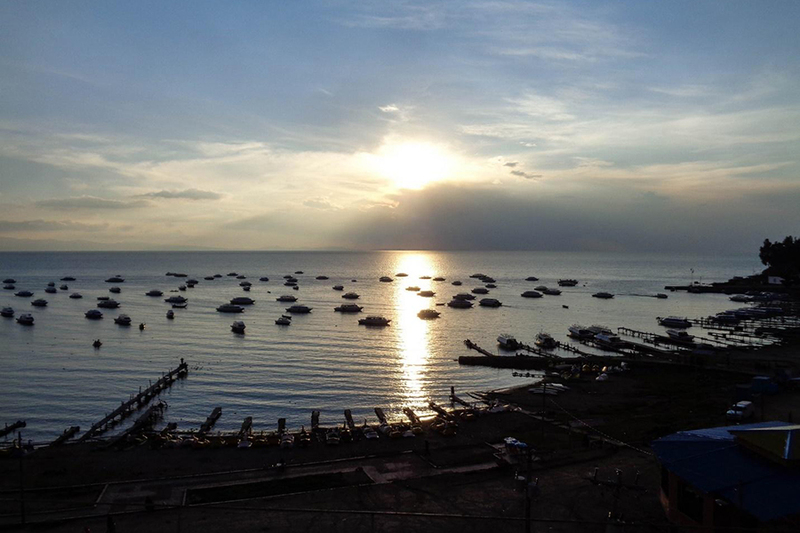 La Paz is the best spot to organise a cycle tour. Gravity Bolivia have a good reputation for providing quality and safe mountain bike tours departing from La Paz. All tours ride downhill, with about 90% of the total riding time being downhill, towards the small town of Coroico. It’s important to remember that when choosing your tour company, you research more than just price. 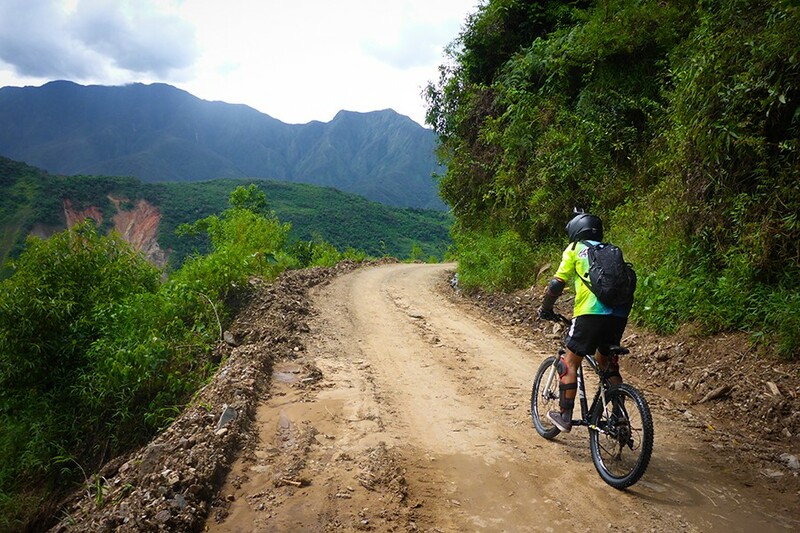 Riding a mountain bike down Death Road has an element of risk and it’s important to ensure that you are adequately covered for health insurance (learn more about how to pick the right policy for you here). Further, read other users’ reviews of the provider to make sure the mountain bikes are maintained in a good condition and the company provides you with well cared for safety equipment. Remember – It is possible to leave your tour at Coroico, rather than returning to La Paz – just be sure to confirm with your tour operator. There are buses and minivans that run between La Paz and Coroico daily and if you planning to visit during high season, or during local holidays, be sure to book your accommodation in advance. For those overlanding in their own vehicle, experiencing Death Road is a must do! Although you have the choice to travel downhill or uphill (or both! ), one of the greatest thrills of travelling Death Road is passing another vehicle on the outside, giving way to the uphill travelling vehicle. You can only get this experience travelling downhill. Given the opportunity to choose your time of travel, hitting Death Road in the late afternoon will provide you with a quieter journey. All of the tours operating out of La Paz hit the road in the early morning – this means hundreds of mountain bikers on the road. Arriving after 3:30pm, will give you the downhill run mostly to yourself, with just local traffic travelling the road. 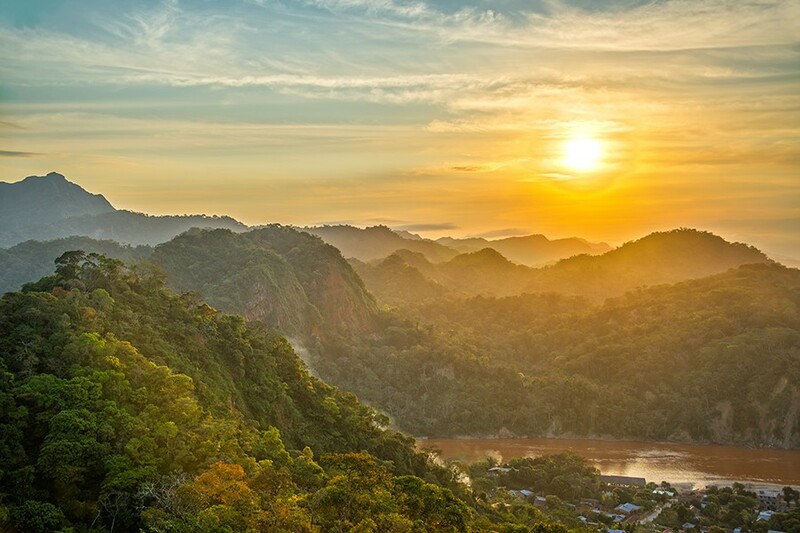 Staying in the town of Coroico is a great option for those travelling with their own vehicle. The town is set on the edge of a mountain, with incredible views over deep, dark valleys to distant snowcapped mountain peaks. There is a multitude of hotels and hostels to choose from and the iOverlander app will help you find one with secure parking for your vehicle. Coroico is a beautiful village, well worth an explore, with some fabulous restaurants and bars to keep you entertained. The main square is the place to be and it is a beautiful spot to sit, relax and people watch. Coroico is a perfect place to escape the bitterly cold nights of the altiplano and rest up with an ice-cold beer. It also happens to be a great place to stop over on the journey to yet another of Bolivia’s wonderous environments – the Amazon Basin. Hotel Bella Vista is basic but clean and well facilitated. It has a terrace, free wifi and private parking, with stunning mountain views. Check out prices and book here. You can take a bus from Coroico (or La Paz) to Rurrenabaque, but beware: it is a long, long bus ride (up to 20hrs) along roads that are not for the faint hearted! Whilst more expensive, the easiest and quickest way (about 45 minutes!) to reach Rurrenabaque if you don’t have your own transport, is by airplane from La Paz. If you are taking driving your own vehicle, you may have ridden ‘Death Road’ for the thrills, but you are about to embark on a death road that still operates as a main thoroughfare, but it’s not that much ‘safer’ than the road leading to Coroico! Tackle this section with caution – allow plenty of rest stops, drive according to the traffic and road conditions and make sure you are feeling healthy and alert. Most travellers who want to hit up the Amazon Basin head straight to Brazil, but you can get the full Amazon experience in Rurrenabaque. 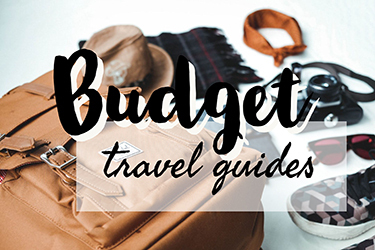 Bolivia provides budget-conscious travellers with the same diversity as on the Brazilian side. It’s also less crowded! Also, remember to have plenty of cash with you as ATMs are not always available in smaller and more remote villages. Once you have recovered from your journey (possibly in the form of a stiff, alcoholic drink! ), it’s time to start checking out tour operators. You will find two main options for an Amazon experience from Rurrenabaque. For those whose focus is on a wildlife experience, a pampas tour might just be what you are looking for. These tours offer a two-night, three-day adventure into the ‘pampas’, which is a wetland savannah that exists on the fringes of the rainforest. All of these tours will take you on a river adventure where you will see a whole variety of animals, including animals, birds, monkeys, bugs and of course, anacondas! If you are wanting the traditional Amazon experience, you might prefer to take a classic jungle tour, venturing further into the rainforest for a two-night, three-day adventure. Heading into the jungle will set you back a lot more than a pampas tour and the chances of spotting lots of wildlife will be diminished due to the dense jungle. However, the opportunity to get down and dirty in the Amazon Basin, interacting with the locals and experiencing the humidity and prolific bugs will be an adventure you will never forget. ● Do your research and ask LOTS of questions – there are reports of pampas tour operators being less than helpful and providing small and unsatisfying meals. Make sure you ask tour operators what is and isn’t included in prices. Understand what kind of experience the operator is selling and what level of expertise the guide has. Find out about the accommodation on offer and make sure you fully understand what you are paying for. Remember – with tours, you get what you pay for. ● DO NOT participate in animal interaction experiences: Avoid tour operators who advertise ‘interacting with animals’ experiences. Cruising down the river or trekking through the jungle and seeing animals in their habitat is perfectly ok. Forcing animals to interact with humans is never acceptable and there are reports of numerous pampas tour operators handling wild animals for the benefit of tourists. 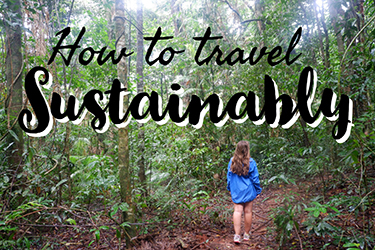 Travelling sustainably and leaving only positive footprints on communities is an essential responsibility for travellers. Hostel: El Curichal Hostel is a backpacker’s paradise: with a swimming pool, wi-fi, TV area, bar with drinks specials and an al-fresco layout. At dirt cheap prices, you can’t go wrong. Check rates and book here. Hotel: Hotel Maya de la Amazonia is peaceful yet well facilitiated, with a pool and breakfast buffet to enjoy in the morning. It’s an ideal spot for a family to stay in Rurrenbaque. Check prices and book here. Ok… I’m still gonna advocate for the overland route here – this wouldn’t be an overland travel blog if I didn’t, right? It’s another grueling 20 hours down to La Paz and then a 6-8 hour but to Cochabamba. Take the flight if you want, it might be easier (heh) but please think about the impact that short plane journeys have on the environment and try and offset the flight. 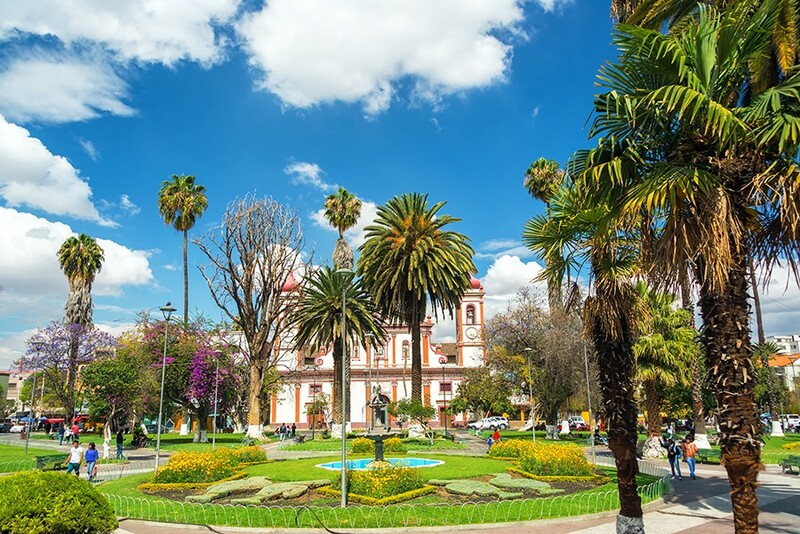 A beautiful city that is slightly off the tourist trail, Cochabamba is well worth a visit. Its low (for Bolivia, at least!) altitude of 2000 metres means that it is much warmer than other cities in the country. 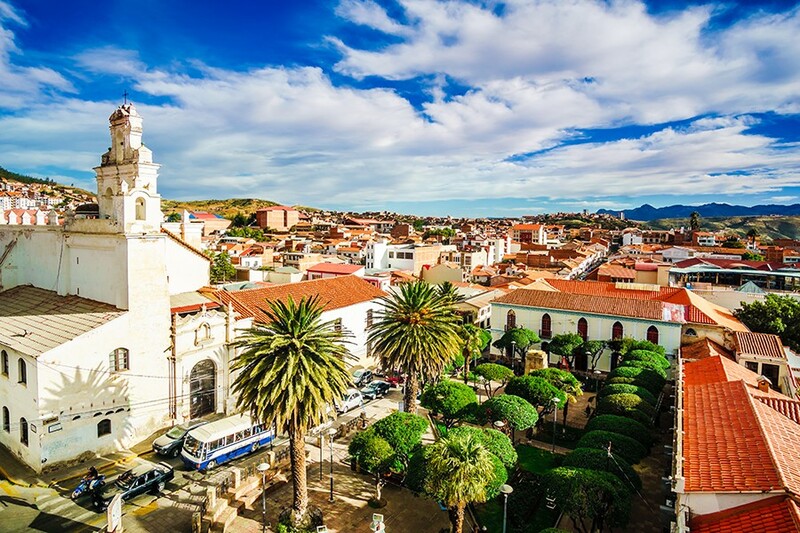 Popular things to do in Cochabamba include seeing the Jesus statue – the largest in South America – and admiring the view off the hills onto the city. The city, with its restaurants and pretty architecture, is very pleasant to walk around. There is also a museum about the city at the University of Cochabamba. If you’re itching to get out into the mountains, you could take a hike to Pico Tunari, a 5100 metre peak. There’s stunning mountain scenery and lookouts, and lots of alpacas! Be sure to book with a guide – it’s not a marked out tour – and the whole trek can be done in a day. Hostel: Running Chaski Hostel Cochabamba is a great spot to kick back in while you enjoy the city. They have balconies, a garden, a bar and cafe and traditional breakfast. Check rates and book here. Hotel: Apart Hotel Regina offers luxury suites in a buzzing district of the city. Enjoy your own apartment, as well as free wifi and a la carte dining from the restaurant. Check rates and book by clicking here. Roughly six hours from Cochabamba is the ToroToro National Park. It is actually heading in the direction of Sucre – but there are no roads between the two. Known as Bolivia’s “Jurassic Park”, it is home to gorges, dinosaur footprints, Torotoro Canyon and limestone caves. It’s a really unique place that shouldn’t be missed on your Bolivia trip itinerary. You can take part in a tour of the park to find out its amazing stories and get a real appreciation for the natural beauty. You’ll need to return to Cochabamba after you’re done exploring the park to reach Sucre. Getting from Cochabamba to Sucre takes around 9 hours by bus; a little shorter if you’re driving on your own. Sucre’s a really fun city. 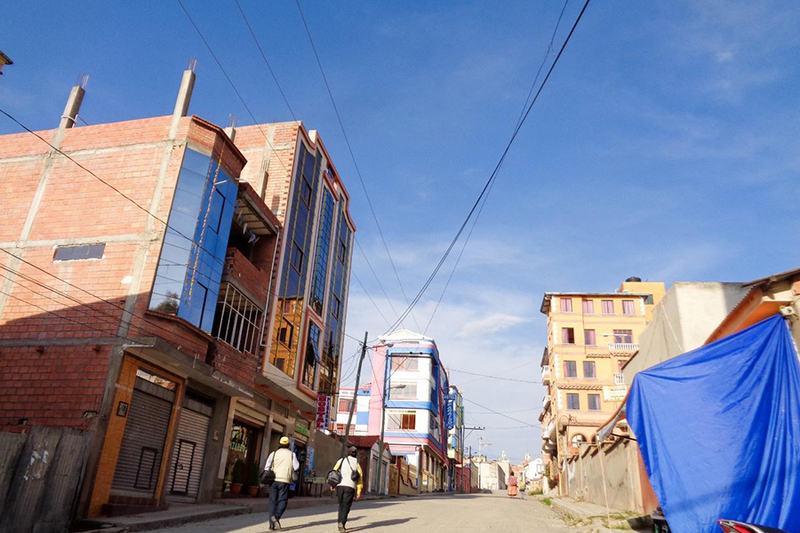 It’s the constitutional capital of Bolivia, and has a cool attitude, with fun bars, markets and really pretty streets. It’s brimming with history, and a walking tour of the city to learn about the tales behind it is one of the best things to do there. The museums are well worth checking out too – full with local history and indigenous art. Sucre is also excellent for vegetarian food! Sucre is also a great spot to study Spanish, with many travellers staying there to take classes. If you are continuing your travels in Central and South America, it might be a good idea to brush up on some basics here! 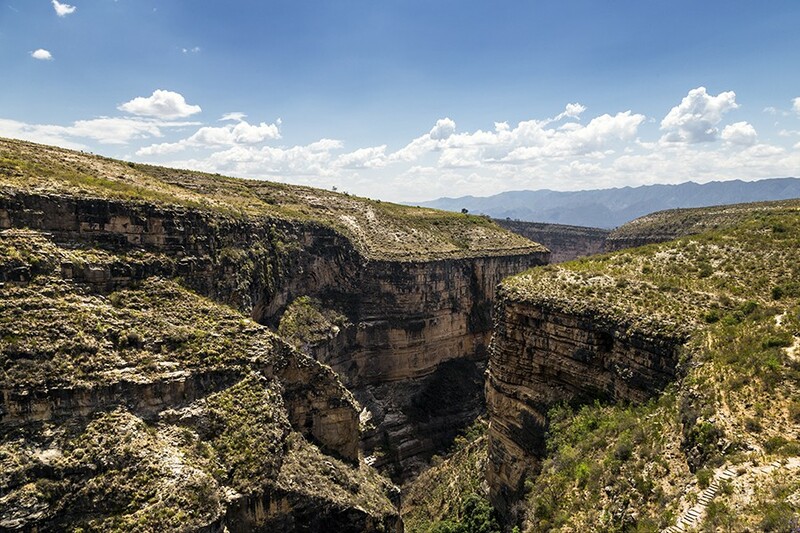 Head 5km out of town to Parque Cretácico to marvel at the world’s largest collection of dinosaur footprints, and the gorgeous Maragua Crater shows you the unique landscape, more dinosaur footprints and fascinating cave paintings. It will take another 4 days of your Bolivia itinerary, but if you love hiking, it’s really a must-do. 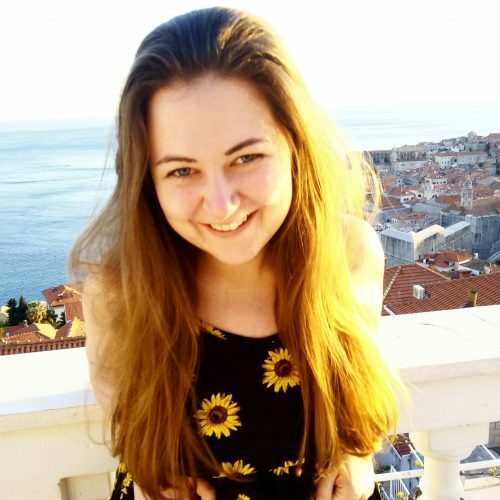 Hostel: The Celtic Cross is a great chill out hostel, with an attached Spanish School! There is a terrace area and they do BBQ nights with vegetarian options. Click here for rates. Hotel: Hotel Villa Antigua is a peaceful space in the mad city. Set in an 1860s mansion, the hotel offers a sauna, gym and an included breakfast. The rooms are bright and airy and feature a bath and a flat screen TV. The hotel is set around a courtyard and herb garden, and is a wonderful place to pamper for a few days. Click here for rates and to book. Getting from Sucre to Uyuni takes around 8 hours by bus, again a little shorter if you’re travelling alone. You’ll want to spend the night in Uyuni (see below for suggested hotels) before taking on the Salar de Uyuni tour. 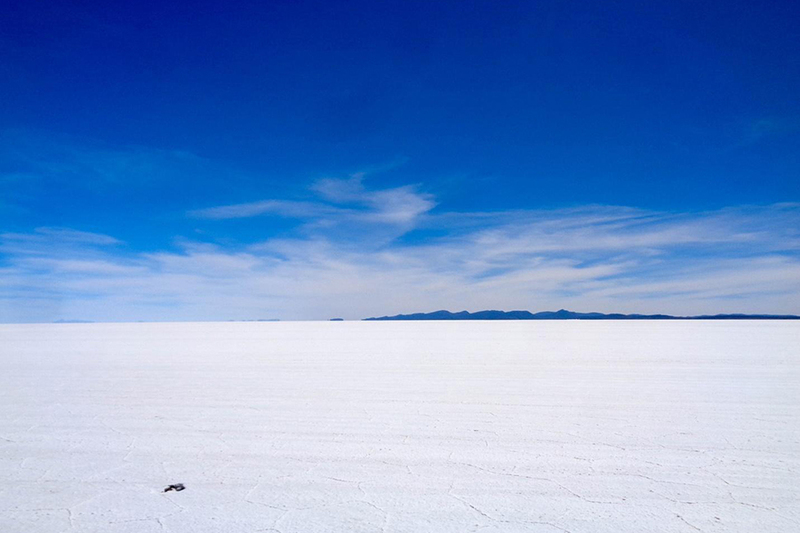 For many travellers a trip to Bolivia’s famous salt flats is the reason they ventured to Bolivia in the first place. The salt flats cover an impressive 10,600 square kilometers and sit at over 3,600 metres above sea level. If you don’t have your own vehicle, you can hop onto any of the numerous tours that run daily from town. Take a 4wd tour out to the illegal Salt Hotel which is built almost entirely from salt blocks cut from the salt plains on which it stands. 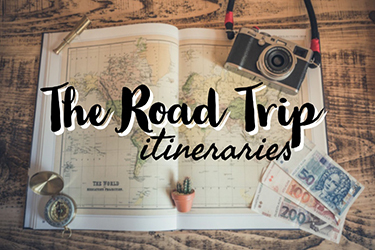 These tours also take you on a journey out on to the lake where you get to see how it looks and sounds – listen to the way the salt cracks and crunches under the vehicle’s tires – as you head into mind-altering nothingness. It is quite an experience. Make sure your tour stops off at the old train graveyard where you can see rusting relics from days gone by. If you have your own vehicle, hit the salt flats and journey off into the whiteness, finding a spot where you can be alone and experience the surreal environments. You can head out to one of the many ‘islands’ and camp for the night, witnessing the incredible night sky above the flats. From the salt flats, you can continue your journey into Chile and into the amazing Atacama Desert. Whilst some tours will return you to the town of Uyuni, others will take you into Chile and deposit you in the Chilean town of San Pedro de Atacama. Hostel: Piedra Blanca Backpackers Hostel is a cosy, clean space with heated rooms, included breakfast and friendly staff. Click here for rates and to book. Hotel: Onkel Inn Wagon Sleepbox is a novel accommodation; offering small ‘pod’ style rooms which are cosy and comfortable. It is just a short walk from the centre, but away from the noise. A perfect place to rest before your tour! Click here for rates and book today. The best time to visit Bolivia is regarded as May to October, although this is the winter so it can be freezing in the highlands. 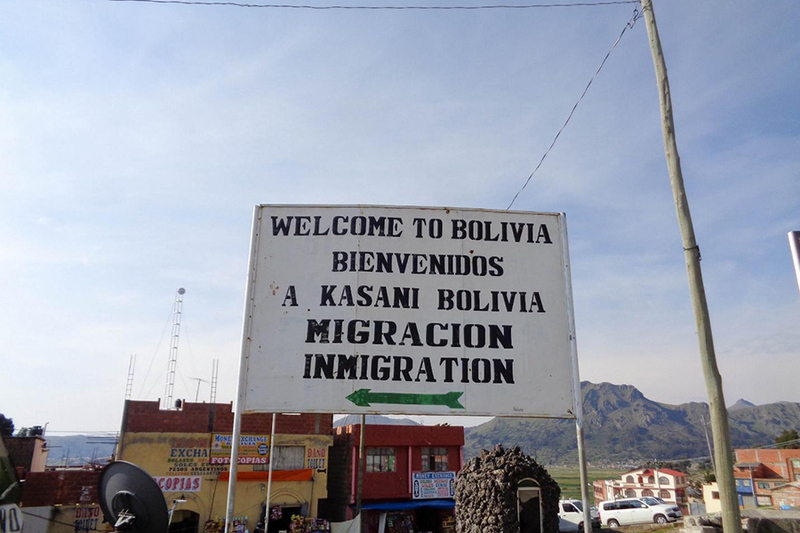 US visitors need a visa for Bolivia. This can be obtained on arrival but costs $160! Most European countries, Australian and New Zealand citizens do not need a visa. Bolivia uses the Boliviano. 1 USD is approximately 6.91 bolivianos. As it is an extremely mountainous country, overland travel in Bolivia is not for the faint-hearted! Pack some travel sickness remedies if you suffer. A little bit of Spanish goes a long way in Latin America. Try to learn some somewhere on your travels. If you are flying into Bolivia, take care – there is a huge risk of altitude sickness, especially in La Paz as it is the highest capital in the world. If you only have a short time to complete your Bolivia itinerary 1 week is sufficient to see La Paz and Salar de Uyuni. If you have a slightly longer Bolivia itinerary 2 weeks will enable you to see the main attractions – if you rush! If you have the time to take it slowly, a 3 week Bolivia itinerary is perfect to see the best of this amazing country. The longer you spend in Bolivia the more you will get to experience the diversity this country has to offer. Bolivia is suited to all budgets and styles of travel, with public transport options being cheap and plentiful. Hopping onto the buses with the locals will give you a truly immersive experience. Learn a few simple phrases in Spanish and say hello to your fellow passengers. Bolivians may seem shy to begin with, but they are a friendly people and will want to know everything about you once you start to talk to them. Your Bolivian journey will stay with you forever. This is a guest post written by Todd and Chantelle, two Australian thirty-somethings with a thirst for adventure, knowledge and meaningful experiences. But we didn’t always understand how to achieve these desires in our suburban lifestyle. On some level, we never felt like we fitted within the conventional mould. No matter what we tried, we couldn’t seem to scratch the itch under the surface and gain that sense of purpose and fulfilment. Over Yonda Adventure Travels grew from our desire to share our experiences with other couples who feel the itch, the desire for more, but don’t know where or how to start to change their lifestyle. We want to show you that you CANT afford to NOT to make the change. Follow us on Facebook or Twitter. Like this post? Why not follow me on Facebook, too (Claire’s Footsteps) and share this post on Pinterest!